It has been 4 weeks since my last post! Im sure nobody is even checking this anymore!!! I have come thru the south of Brazil, Uruguay and Argentina and am now in Bolivia. First stop was Tupiza where my travelling buddy Luke and I started a 4 day jeep tour of the Salar de Uyuni (Salt Flats). Tupiza is at about 2900m and I could instantly feel this when we arrived. I started getting heart palpatations and found it difficult to breathe! The jeep tour was so incredible! Bolivia has got the most stunning landscape I have ever seen - it definitely rivals NZ! If NZ is famous for 4 seasons in 1 day then Bolivia is famous for 20 landscapes in one day! We went from 2900 up to 4200m on the first day which was a wee bit too much for poor me!! I spent the first night with the worst pounding headache I have ever experienced in my life. I thought my brain was trying to break out. I dont ever want to feel that again!! The nausea set in at about 3am to join the beating head and by 5am I was throwing up.....oh how nice. On my shoes too. After about 3 vomits (i will spare all the details) I managed to hold down an altitude sickness pill and off we went to start day two of the tour (12 hours driving across hard out roads, mountains, valleys you name it!). I gradually got better but even after a week now in Bolivia I still dont feel 100%. This altitude thing aint nice! Imagine sitting in a 4wD,dust coming in every possible oriface of the vehicle, bumpy single track roads, over 4000m of altitude, no toilets (i have now sprinkled my way thru Bolivian soil), and a driver and cook that dont speak any English! Aside from all of that it was AWESOME and we had a wicked time! Totally recommend it to anyone thinking of travelling this way! Am now in La Paz.....What a crazy city. Bolivia is so poor and even in these big cities you can see the poverty instantly. The city is at 3600m and sits among mountains. Spectacular views as you drive into the city! I have had an amazing time here. Yesterday I survived mountain biking down the World´s Most Dangerous Road....what a complete buzz. There is NO way in a million years this would ever go down in NZ. Total craziness, a 400-500m drop off to your left, no barriers, and cars still using the road (which isnt sealed either). Total madness but the biggest adrenaline rush eva!!!! I was pooping my pants for the first 30 mins or so but soon relaxed a bit and totally enjoyed it. You can never relax too much tho because one wrong move equals bye bye bye bye bye.............but wow the view from up there and biking down was WICKED!! Today would have to be the highlight so far of my trip. I went to visit the child that I sponsor here in Bolivia. I was met at 6am by two Bolivian ladies ( a translator and a lady from the project) and we went Bolivian styles (a local cattle class bus) for 2 hours into the middle of nowhere to the small village where Daniel lives! Comanche has a population of 600 and well over a third of them are children. In the project run by Compassion there is 237 children registered at the moment. When we arrived at the village I was gawked at left, right and centre....a few people followed us down the road as we walked to the Project (the school where i was meeting Daniel). I was so nervous but as soon as I met the family and Daniel I instantly fell in love with them (surprise surprise ha ha). This village is in complete poverty. They have next to nothing and live in houses pretty much made of mud bricks - some are fortunate enough to have a brick layer on top like Daniels family. At the school they had a whole day itinerary planned for my visit....a prayer and some words from the pastor, songs to sing me, and then I had to speak. It was really emotional and I cried (again another surprise ha ha). Daniel´s father told me that they had been praying every day that I would visit them and they were so so amazed and excited that I actually came. Apparently I am only the 2nd sponsor to visit a child in their village! Daniel was very shy and didnt say much but he stuck to my side all day and didnt let go of my hand! They feed me twice (which was a little scary considering it was such a tiny village with no electricity and i was worried about the state of the food) but I ate anyway and am hoping now for no consequences of that!! 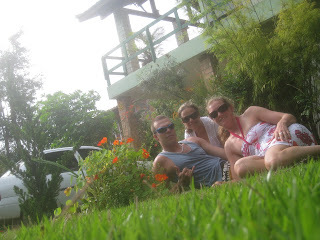 Daniel´s family took me to their house - very very basic. The whole family sleep in one room upstairs and underneath is the kitchen area. Apart from that there is a dirt back yard where they spend most of their time. I gave Daniel and his brother a few things i had brought from NZ and then took the whole family down to the local tiny market to buy them food and essentials. Anastasia (daniels mum) was so humbled and such a lovely lady. At first she was very shy to buy things but I made sure the translator told her to go for gold so she soon got into it. Rice, sugar, pasta, oil, shampoo, matches, veges, fruit...it was a completely humbling experience for me and one that i will never forget. I bought Daniel a soccer ball as well and he was so stoked. We got into a game in their back yard but it lasted about 2 mins before i died of lack of oxygen!! Much to the amusement of the whole family! When it was time to leave Daniel came up to me and said (via the translator) that at church on sunday he had prayed for me to come as a Christmas present and here i was. He just couldnt believe that I had come all that way for him. I started crying and he started crying...it was very emotional and difficult for me to leave them. I have promised to return one day when Daniel is a little older and I can see how much he has grown and learnt! This was an unforgettable experience and if anyone out there is thinking of sponsoring a child just do it!! They are so so grateful and I was able to see where my money is going and the good things that my sponsorship brings to Daniel and his family! The bus back to La Paz was even more cattle class than the one we arrived on. They pack them so full with the locals and their children, animals, bags etc. And to top it all off an old woman decided to sell some of her llama parts to someone else on the bus and proceeded to pull out llama feet, guts, organs etc. It was repulsive!!!!!!!!!!!! Am heading north tomorrow to Lake Titicaca - i think its the highest lake in the world! On the bus ride from Curitiba to Florianopolis I met a Brazilian guy who decided to tell me his life story and let me know he was on his way to try to get his ex-wife to sign divorce papers......lovely........It was so good to get to Floripa. What an incredible place!! I just absolutely fell in love with it. 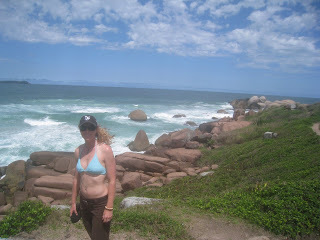 So many beautiful beaches and such a chilled out vibe. Felt quite different from the other places I have visited in Brazil. I was so lucky to have my friend Leo there and so I stayed with him, his Mum and his sister, Tatiana, in their apartment close to the centre of Floripa. Leo was the best tour guide!! So awesome to know a local person - I got to see so much of the island and he drove me around everywhere! They looked after me so well and feed me almost too well!! I have now tried a few foods that were quite foreign to me. Soft polenta (just corn flour, salt and water cooked in the pot and then eaten as it is like we would eat rice! ), pizza dolce (sweet pizza ayeeeee loads of chocolate and strawberry pizza, and banana, mozzeralla and cinnamon pizza), and Leo's mum's yummy rice risotto with zucchini, curry, and cheese. The seafood in Floripa is great too, so of course I sampled some prawns and fish cooked the Brazilian way. 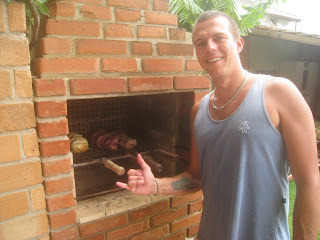 Oh yeah, and I got introduced to Brazilian Styles BBQ care of Leo the maestro chef!!! It was all good!! It has been raining a lot in Florianopolis over the past few weeks but i was lucky enough to get some sunshine during the day and it would rain hard out at night. Some days were just too overcast and rainy but I still loved it anyway! 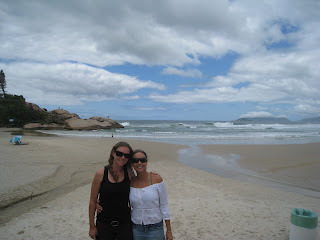 My plan was to stay in Floripa for about 4 days but I was having too much fun so I extended it to a week! Any Brazilian people reading this blog will be happy to know that I have bought a brazilian bikini...ahhhh yes thats right! Its a brazilian trainer bikini...not as revealing as the real mccoy but definitely different to the good old conservative kiwi styles! Doubt if that one will ever come out in NZ! This is me and Leo's mum.....I just love them and will miss them heaps!! 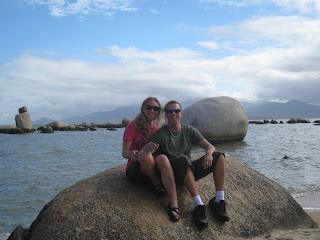 Leo's family also have a beach house in Rio Vermelho (Red River) and so we spent a little bit of time there too. Such a cute little house and Leo's mum has decorated it so beautifully with bits of her art and pottery as well as things from around the world! 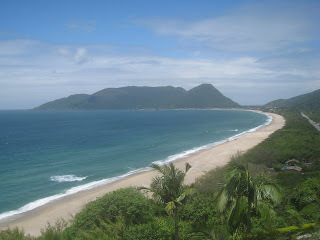 I could seriously live in Floripa! 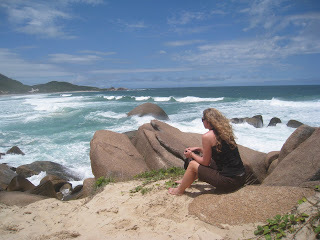 If I was to move to Brazil....this would definitely be it! Don't worry family Im not getting any ideas just yet!! After leaving Bonito, Avi, the girls and I went our separate ways....I spent the next two days (after a marathon 22 hours on the bus) in Curitiba on my way to Florianopolis. The only reason I stopped here was to go on a panoramic train that I had read about. 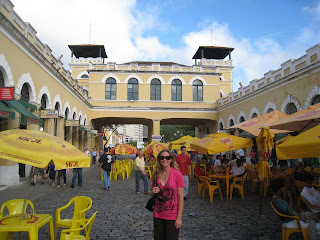 Unfortunately it rained most of the time I was in Curitiba!! I managed to get on the train - it was a cloudy day but the views were still great. I felt totally lonely in this city, I was too scared to go out after dark alone and the hostel I stayed in was not really traveller friendly....there were no other foreigners and it didnt have a common area to meet other people. I was glad to get on the bus after 2 days and get to Floripa!!! The panoramic train ended in a little town called Morreto. Children were running alongside the train and everybody was throwing food and drinks out the windows to the kids. Day 3 horse trek!!! I loved it!!!!! The pet parrot at Santa Clara - well it was a pet but they warned us not to try to touch it or we would get biten!! Beautiful!! I am nearly 2 weeks behind myself in keeping up to date with blogging!!!! Most of the internet places in the hostals are soooo bad and so slow and frustrating so trying to get photos uploaded is a mission! 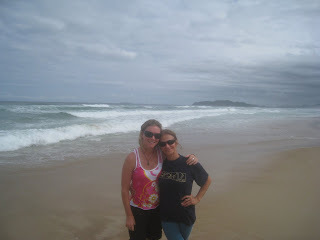 After leaving the Pantanal I travelled with Avi and 3 other girls to an awesome little place called Bonito. It totally lived up to its name (bonito is beautiful in both portugues and spanish).....we had a fantastic 2 days there. Snorkelling in the crystal clear river and visiting a cave that had incredible blue water (grutos lago azul). It was very relaxing and we felt really safe there. Walking around at night at 1am was no problem at all. The locals were really friendly. 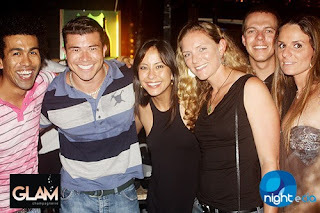 We frequented the bar across the road from our hostel a couple of times to hang out with the awesome people that owned it! Our marks are now permanently on the wall of their bar - they get all travellers to write on the wall! Its very cool! I had my first taste of Brazilian Cachaca....its alcohol made from sugar cane....to me it tastes like pure ethanol!!! But its a fav with a lot of travellers and obviously the Brazilian people! In true Kiwi Carla style I nearly spat it out.......and proceeded to order a beer! We decided since we had just spent 3 days hanging out with Caiman in the Pantanal we had to at least see what they tasted like so in Bonito we also sampled a caiman curry! Not bad! The largest rodents in the world - cute family! Carlos our crazy barefooted guide!